The parish was in the Claypole Sub-district of the Newark Registration District. You can also perform a more selective search for churches in the Barkston area or see them printed on a map. The Anglican parish church is dedicated to St. Nicholas. The church was originally constructed in the 12th century and rebuilt in the Gothic style. It underwent several restorations in the 19th century. The church seats about 200. Richard CROFT has a photograph of St. Nicholas' Church on Geo-graph, taken in October, 2005. The parish register dates from from 1561 through 1944. The Lincolnshire FHS has a Loan Library service which has the parish registers on microfiche for Baptisms from 1561 to 1812 and Marriages from 1561 to 1812. We have the beginning of a Parish Register extract in a pop-up window. Your additions and corrections are welcomed. Shelly CLACK provides a list of names from the churchyard memorials. This is a Rich Text File and should open in your word-processing software. The Wesleyan Methodists also had a small chapel here, built in 1832. For information and assistance in researching this chapel, see our non-conformist religions page. Barkston (sometimes "Barkston le Willows" or "Barkstone in the Willows") is both a village and a parish 4 miles north of Grantham and 110 miles north of London. Marston parish lies to the west, Syston parish to the south. In the eastern portion of the parish is Barkston Heath, and part of that is now an RAF training airfield. The parish covers 2,100 acres in an east-west orientation. Take the A607 trunk road, which passes through the village, north out of Grantham. Watch for the SIGN. Glyn BAKER captures the village sign well on Geo-graph, taken in 2012. Ian PATERSON provides a photograph of the village on Geo-graph, taken in 2010. Travellers to Barkston may wish to stay overnight at Barkston House (Tel: 01400 250555). Ask for a calculation of the distance from Barkston to another place. You can see the administrative areas in which Barkston has been placed at times in the past. Select one to see a link to a map of that particular area. There are several ancient quarries to the east of the village on the heath. Legend has it that Robin Hood used to frequent Barkston. Alas, he does not appear to have left any genealogical references behind. Barkston was a barren heath until about 1790. The Great Northern Railway used to serve Barkston with passengers and freight at Barkston Station, a mile west of the village. The railway stills runs to the west and north of the village. Perhaps because of the nearby airfield, there are several Barkston paranormal sites on the Internet - no, I'm not providing Links to those. In 1930 the Stag Public House provided a place to catch up on local news. Wm. Nicholson is listed as running the place in the 1930 directory. Thomas PACY was lord of the manor here under Henry VI. The principal landowners in 1871 were the J. A. HOUBLIN and Sir John H. THOROLD, baronet, of Corpus Christi College, Oxford, and Wm. CROPLEY. The principal landowner in 1913 was Sir John H. THOROLD, baronet. The RAF opened an airfield here on the heath east of the village in April, 1941. It was initially a relief landing field. It was closed in April, 1943 to relay the runway and reopened in January, 1944. The USAAF started using the field in February, 1944 and left in April, 1945. The RAF ceased operations here in April, 1945. The RAF reopened the field in 1954 and it is still listed as an active field. Click here to see the Barkston War Memorial and the list of names inscribed thereon. The name Barkston is a combination of Old English and Old Scandinavian in Barkr+tun, for "farmstead of a man called Barkr". It appeared in the 1086 Domesday Book as Barchestune. Here's a partial list of surnames found in Barkston in 1871: BAILEY, BARBER, BLACKBURN, BRETT, BREWSTER, CROPLEY, FORRESTER, GILES, GOODACRE, HAMILTON, HAND, HOLMES, HUNTER, JERMAN, JOHNSON, KENNEWELL, MARNHAM, MARSH, MILLAR, MORLEY, NIXON, PARR, PEACOCK, POWER, ROPER, STANHOPE, THOMPSON, WARD and WRIGHT. Kelley's 1913 Directory lists these surnames: BARNES, BURTON, CLARK, CLEMENTS, COTTAM, DICKENSON, ELMORE, GIBSON, HAMILTON, HARRIS, HUMPHREYS, MACKEARS, MORLEY, NEVILLE, NIX, NODEN, PARR, ROBINSON, SCARBOROUGH, WADKIN, WARD, WATSON and WILKINSON. Prior to 1842, the parish was in the ancient Loveden Wapentake. The parish was also in the Soke of Grantham. 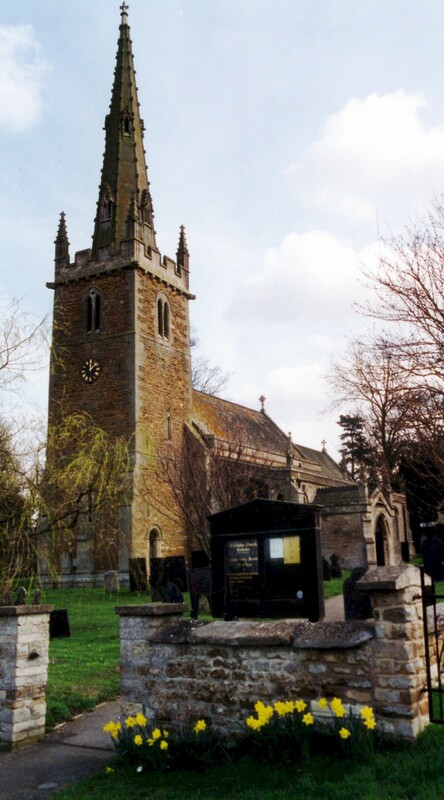 The parish was in the ancient Winnibriggs and Threo Wapentake in the South Kesteven division of the county, parts of Kesteven. Six almshouses for the poor were built here in 1640, founded by Richard HICKSON. These were rebuilt in 1839. David BEVIS provides a photograph of Hickson's Almshouses on Geo-graph, taken in 2012. There were eight additional almshouses for the poor, along with sixteen acres of land ("poor's land") in the 19th and early 20th centuries. The Rev. John BROUGHTON left the interest on £10 for the poor beginning in 1736. In the 1870's, J. A. HOUBLIN provided a yearly donation of £20 for distribution among the poor at Christmas. The first Free School was built here in 1835 on land given by Mrs. NEWTON. It was enlarged once (torn down and rebuilt) in 1875 to hold 80 children. The parish had a small charity endowment left by Selina TOWERS in 1718 for the education of poor children.